Uber has become a multibillion-dollar Goliath in record speed by giving individuals a way to easily become entrepreneurs. The San Francisco ridesharing technology giant, which has been valued at north of $40 billion, has reportedly secured another major investment. The most recent round was for $1.6 billion of convertible debt and was largely financed by Goldman Sachs, according to The Wall Street Journal, which cited sources. That comes on the heels of a $1.2 billion round of equity investment announced in early December. That’s a whole lot of cash. As Uber looks to make good on its unabashed goal to take over the world, it’s also lifting a veil on its driver demographics. The company today released the results of a study that polled hundreds of Uber drivers in 20 cities across the U.S. The study, commissioned by Uber, was conducted in mid-December by research firm Benenson Strategy Group. Princeton economist Alan Krueger helped with the analysis. The findings show that drivers’ major reason for working with Uber is because it allows them more autonomy. Nearly 9 out of 10 Uber drivers report that “being their own boss” and being able to set their own schedule was a primary reason they opted to drive with the company. Eighty-five percent of respondents also said a major reason they work with Uber is to have a greater work-life balance. And as those drivers look for more freedom, they are also making more money. Seven out of 10 survey respondents said they make more money now than they did before they partnered with Uber. The admittedly self-congratulatory survey found that for 3 in 4 drivers, the work provides steady income. So who exactly are these Uber drivers? They are primarily male, though less exclusively so than in the traditional taxi industry, and the majority (7 out of 10) are working to support either a child or a parent living at home. In other words, Uber has become a much needed source of income for a lot of Americans. Those who have never worked as a professional driver before make $19 an hour on average, while drivers who used to drive black cars professional are taking home $27 per hour on average. Also, Uber drivers are surprisingly skewed older. If your image of an Uber driver is a kid out of college unable to get a “real job,” consider that more Uber drivers are over 50 than are under 30, according to the data. 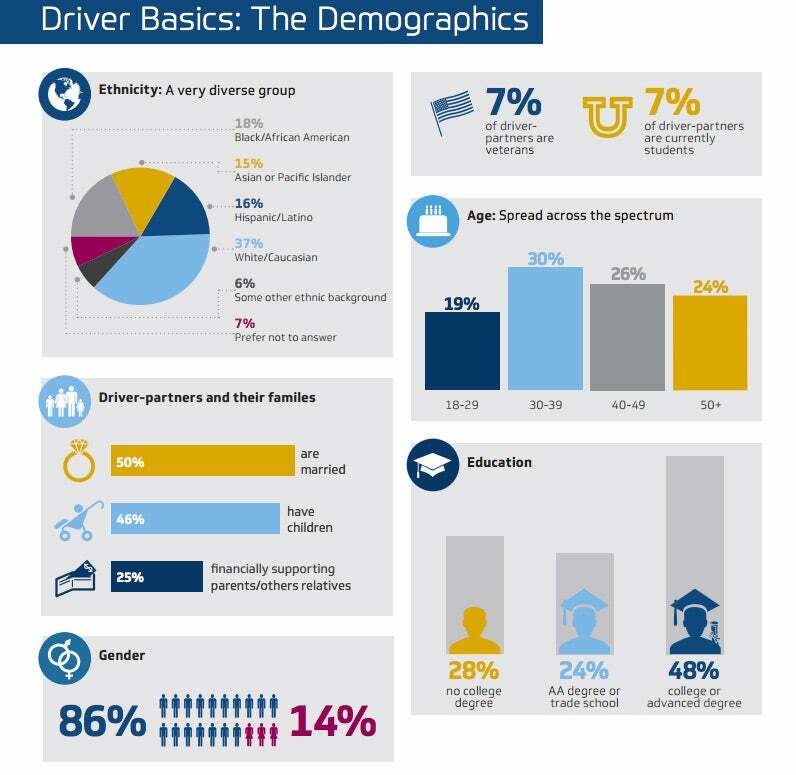 Have a look at the graphic below for a deeper dive into who Uber drivers are, from their education to their ethnicity.